45 Information reached me from a pen pal in Denmark in early 1988. I became much interested and contacted Patti Melvin in Texas. Fr. Albert Kretschmer started promotion in the same year in Accra. Fr. 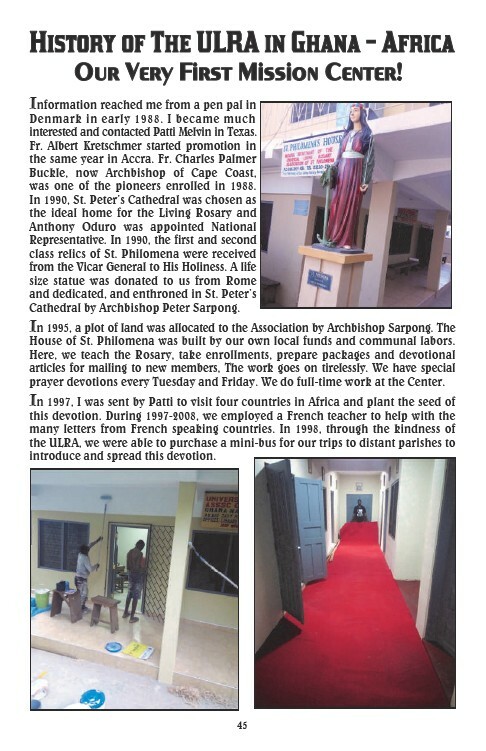 Charles Palmer Buckle, now Archbishop of Cape Coast, was one of the pioneers enrolled in 1988. In 1990, St. Peter’s Cathedral was chosen as the ideal home for the Living Rosary and Anthony Oduro was appointed National Representative. In 1990, the first and second class relics of St. Philomena were received from the Vicar General to His Holiness. A life size statue was donated to us from Rome and dedicated, and enthroned in St. Peter’s Cathedral by Archbishop Peter Sarpong. In 1995, a plot of land was allocated to the Association by Archbishop Sarpong. The House of St. Philomena was built by our own local funds and communal labors. Here, we teach the Rosary, take enrollments, prepare packages and devotional articles for mailing to new members, The work goes on tirelessly. We have special prayer devotions every Tuesday and Friday. We do full-time work at the Center. In 1997, I was sent by Patti to visit four countries in Africa and plant the seed of this devotion. During 1997-2008, we employed a French teacher to help with the many letters from French speaking countries. In 1998, through the kindness of the ULRA, we were able to purchase a mini-bus for our trips to distant parishes to introduce and spread this devotion.